Here in Sweden we’re celebrating midsummer’s eve today, and for yours truly that means a pretty rustique lunch at the parents place. 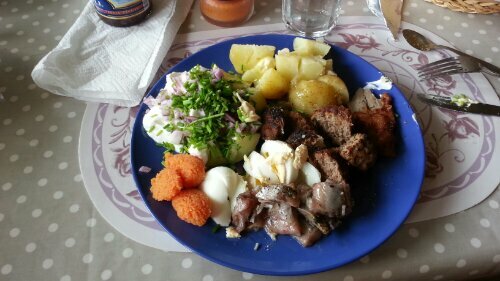 Meatballs, herring, potatoes along with some other stuff is what you’re seeing in the photo. Watch the skies of France at 10 today! Airbus Industries’ brand spanking new machine the Airbus A350 is scheduled (as of last night anyway) to take to the skies for it’s maiden flight today at 10:00 CEST. All this will happen at Airbus’ HQ in Toulouse, and will be preceeded and succeeded by some sort of festivities i am sure. Hope it all goes according to plan! It’s gonna be a battle of the tech giants this holiday season! At the E3 2013 (Electronic Entertainment Expo) currently under way in Los Angeles Sony has landed a few punches at arch rival Microsoft in the battle of console gamers. With a reported launch price of $399, or €399 depending on which side of the pond you live on, it looks as if Sony is going to undercut the Xbox One by a full $/€100 with their Playstation 4. In addition and unlike Microsoft Sony further announces no issues with backwards compability for PS3 games, and yes, used games will be free to play on the PS4. It’s shaping up to be an interesting holiday season this year. Now, if i could just get my hands on BOTH of these machines i’d be a happy camper! 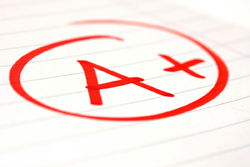 Straight A in level B High School English – DONE! Got my grade for the B-level High School English today; straight A!! Awesome! Now i’m finally fully eligable for business studies at the university this fall, which does feel pretty fantastic! I just wanted to get this final formality out of the way, and now it’s finally done. Japan starts the week swingin’! The hyper strong movements up and down on the Nikkei Japanese stock index seem to continue as the Nikkei closes trading for today at almost + 5% (4.94%)! The market was very pleased with better than expected GDP numbers for Q1 and recieved some confirmation that Abenomics is working. The economic stimulus actions put forth by prime minister Shinzo Abe that is. Anyways, great start of the business week! U.K economy needs a female touch! Recent research apparently finds that the U.K economy would add some hundred thousand new jobs if more companies were owned by women. Controversial findings? I don’t know what to think. What do you think? Wierd word of the day – Glossophobia! Glossophobia means the fear of public speaking. According to a survey that was conducted by the National Public Radio in America, 43% of people said their greatest fear in life is public speaking. The people who completed the survey even stated that they feared public speaking more than death! Although this may seem extreme, it is no secret that most of us hate public speaking and just the thought of giving a presentation is enough to leave you with feelings of anxiety and hesitation. On a personal note this is something that i need to improve on; i’d love to be able to give a presentation with confidence and without feeling nervous. If that is at all possible, that is. If even Jerry Seinfeld fears public speaking, then who doesn’t? Candace McDonald has more on this topic right here.